C:\>wmic service get name, displayname, pathname, startmode |findstr /i "auto"| findstr /i /v "c:\windows\\" | findstr /i /v """
Metasploit has a privilege escalation module to take advantage of this but I couldn't find a simple standalone way of showing a proof of concept for this issue. Taking the easy option and copying cmd.exe to the path fails to execute as it is not a proper Windows service application, we decided to write our own service to demo this! SecQuestCMDService is a Windows service app that you can copy into the path of the service you want to exploit which will pop up a command shell running with NT Authority\System privileges. It has been tested on Windows XP and Windows 7 and may allow privilege escalation in places where good old exploits like sethc/magnify are blocked by policy. Getting this working took a bit of trial and error starting with the old favourite of using "AT" which we soon worked out isn't allowed to run interactively on Windows 7. Running cmd.exe directly worked; you can see it in task manager but you can't see the Window as the initial service isn't marked as interactive and so on! The way we finally got this program to work is that the initial service uses "sc" to create a new service, sqcmdsvc, which it then tries to start. 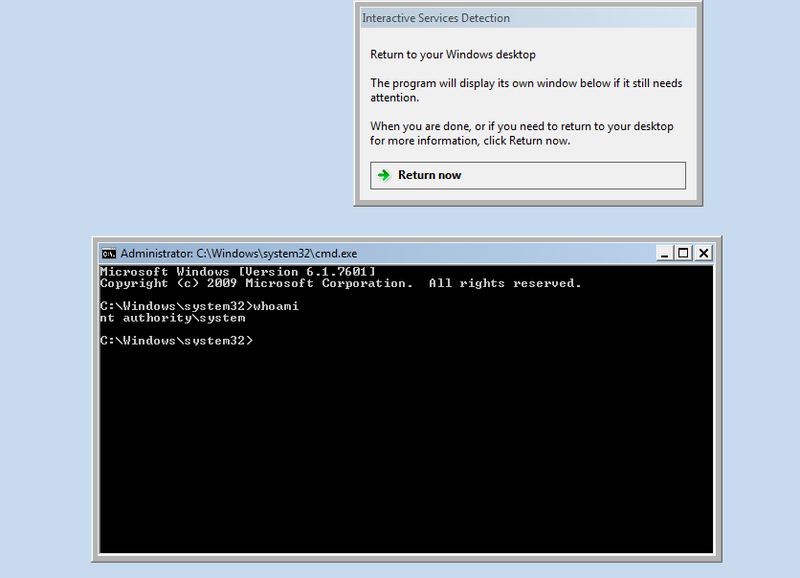 The sqcmdsvc is created as an interactive service which then allows it to load cmd.exe which can now be seen. sc description SQCMDSVC "Helping you p0wn your Windows!" You'll probably find that getting the executable on to locked down boxes is going to be a challenge, most will need administrator privileges to be able to copy files in to C:\Program Files\* - mounting the hard drive may be the way to go if it's not encrypted. Bounce the "CorsairSSDTool" service, wait a couple of seconds and you've got a shell! Similarly on Windows 7 we can exploit HTC's internet pass through service.. If you check in Windows services you'll see that a new service, "SecQuest Command Service", is installed.. that can be manually started as well in-case you need to use the command shell again. For some reason sometimes the command prompt isn't displayed the first time the vulnerable service is run although the sqcmdsvc is installed, starting sqcmdsvc manually should give a shell as expected. To clean up, from a command prompt, type: sc delete sqcmdsvc -> Top Tip: if you've got the services window up still the service won't be deleted until you close it. The relevant vendors referenced in this post have been informed and we'll update it if we get any feedback. These guys aren't the only ones, there are 100's of other vulnerable services out there just waiting to be found!